Description: Digital image from Kim E. Piersol original 35mm Kodachrome transparency. 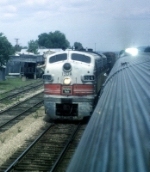 KCS had a long-standing practice of putting minimal markings on B units during all of the early diesel era. They generally didn't even say "KCS" or "Kansas City Southern," much less have a prominent unit number. The latter was usually very small and appeared in one lower corner of the locomotive's side. When the white livery was introduced in 1973, that practice continued for a few more years before large red letters "KCS" were applied. The B unit in the photo could be any of a number of KCS F3B's. To propose any particular number would be nothing but pure guesswork. Description: ex-F7B 310A:2; rebuilt into RCE receiver car. Description: Kansas City Southern F3B 30B and an unidentified A-unit were being moved around at New Orleans on New Year's Day 1949. Description: Chicago Burlington & Quincy Railroad F3 116D at Fort Worth, Texas on an unknown date in 1949, photograph by R. S. Plummer, print by Gordon C. Bassett, Chuck Zeiler collection. Description: Chicago Burlington & Quincy Railroad F3 116D eastbound at Naperville, Illinois on March 26, 1966, Kodachrome by Chuck Zeiler. This locomotive was built in October 1947 (c/n 4405) on EMD Order E790, and was traded in December 1966 to GE as credit on an order for U28B's. Description: This is at the Fairview Ave. commuter stop. Thiird unit is probably a F7A. Description: Third unit is probably an F7A. Description: Third unit is probably an F7. Description: This train was called the Pick Up. It was the local between Savanna and Eolaand could run 80 cars long. Here it is in the siding, main track is in the foreground, about to set out and/or pick up cars. Description: Taken on Dynachrome (ISO 10) at the Fairview Ave. Commuter Stop. The film was so slow that even panning the camera only caught the number board in focus. Description: Note rods for the interlocking. Description: Was originally part of C&BQ 128DCBA F3s built 1948. Description: I wrote nothing but the date and "130AB" on the slide, so here is a good guess about what you are looking at. Photo shot from a dome on the westbound Morning Zephyr (the sun reflection is a big hint) somewhere on the CTC single track main east of Savanna and west of Aurora. 130A is in the hole. Since the freight is short and the brakeman is getting on and watching the Zephyr, I assume this is the local morning (Savanna to Eola) freight called the Pick Up done with its work here. I was deadheading to Saint Paul to work Oakland Tower for the Q. I worked as a leverman, operator, and/or station agent for the Q for two summers during college. Description: CB&Q F7A-F7B-F3B-F3A lashup led by F7A #133A, other engines are more than likely #133B, #133C, and #133D. This is most likely the curve at Lisle, IL, on the "Racetrack", making this a westbound manifest headed towards Aurora and Galesburg. Scanned with an Epson V550 from a duplicate Ektachrome 35mm slide. Description: AMTK 155 has reached the end of the line, being officially retired in October 1975. Description: *Note, there is actually no way to tell if the F3s are 163BC because two other F3s could have been hooked on that day. Assuming they are, then we have 163A F7A blt 1950, 163BC F3B F3A blt 1948 and a 2 car Dinky. This is no doubt the Fairview Av Interlocking. Description: This may be the "A" end or "C" end. Both look the same. Description: Early F units usually came in set of 4, i.e., ABBA. The CB&Q found that for most trains on its mostly flat railroad ABA sets were sufficient so the ABBAs were broken into ABs with another newer A added. On the CB&Q an ABBA set was lettered ABCD and an ABA set was lettered ABC. In this picture we see CB&Q 165A, an F7A and 165B and C, F3Bs. The train is the early morning "Pick Up" at Milledgeville, IL (122 miles from Chicago on the Twin Cities Line). If the train had a number, it was never used on the dispatcher's line. Yes it is a heck of a train to be doing local switching, but it did weekdays. Description: Early F units usually came in set of 4, i.e., ABBA. The CB&Q found that for most trains on its mostly flat railroad ABA sets were sufficient so the ABBAs were broken into ABs with another newer A added. On the CB&Q an ABBA set was lettered ABCD and an ABA set was lettered ABC. In this picture we see CB&Q 165A, an F7A and 165B and C, F3B and A. Is this the A end or the C end? Title: Don't ever buy cheap film!! Description: Waiting to board for our journey to Spartanburg SC. There was a second B unit in this consist, but I don't have it's #. Title: Trying to be a gentleman, I stayed with my wife and daughter. Description: It sure looked like fun up there, though. Just wish I knew that third unit #. Description: Back when strings of Santa Fe F-units could still be found at Clovis, running east into Texas and south to Carlsbad; F3B 201A sits between a pair of former passenger units. One source says this unit went to GE for a U28CG in 1966, which does not appear to be the case. Description: Erie Ave, Date Unknown.